From the size of the doorway to the insulation grade of the door's materials, these are just a few of the factors you have to consider when choosing a door for you warehouse. We have created a list of 5 major considerations of any door selection process for you. Hopefully by working through these 5 items you will find yourself much closer to choosing the right door. Making sure your door is no larger than the maximum required size will save you a considerable amount of money. You will make savings on the initial cost but also on the energy costs of lowering and lifting the door and in the case of temperature control on the cost associated with the disparity between door and wall insulation. Some of the other considerations below affect the optimal size of your door. For example, with high-speed traffic you need to allow extra clearance to accommodate each vehicle and its load, plus a margin for human error. The size should also be further increased if traffic needs to turn on entry or departure, to give room for the vehicle’s turning circle, and also to reduce the risk of damage to the doorframe. What is the purpose of your door? If your warehouse is involved in food storage then issues of contamination will be a major factor in which door you choose. Doors for food manufacturing, distribution and storage areas need to be high speed, tight sealing and durable. You need to have a minimum open time for the door, no passage between the two areas the door segments and a low risk of door malfunction. Doors such as rapid roller doors fulfill these functions well. Whereas, in the case of cold storage it is essential to have something with high insulation and speed, a lack in either of these will increase your energy costs immensely. High-speed freezer doors have been designed specifically to answer the need for superior insulation and minimum open times. Many Warehouses and work areas today are temperature controlled for the comfort of employees. Doorways without effective automatic closure will expose employees to cold draughts, and increase energy costs to compensate for the impact on the airconditioning system. High speed rapid roller doors are an effective means to management of these issues. You should always consider the needs of your warehouse operations and the daily role of your doors in respect to them. There are ideal doors for every situation and by doing this you are more likely to get a door that will benefit and maybe even enhance your operations. This concerns the amount and type of traffic going through your door. Most warehouses require the resting position of a door throughout the day to be closed. This may require you to select a door that is capable of opening and closing 30-100 times a day and while there are some doors specifically designed for this purpose there are many designed to open only once a day. When you select your door make sure you match your opening requirements to what you require from the door when it is closed. Insulation, security and reliability are other things you need to match to the door’s traffic requirements to select the right door. Safety is a crucial feature of any door and it involves much more than simply purchasing a door with adequate brakes in case the lifting mechanism fails. Safety of a door also encompasses the training you give your team and the protocol you put in place involving use of the door. Having a safe door means having a team that understands how the door works and how they need to work in respect to its function. 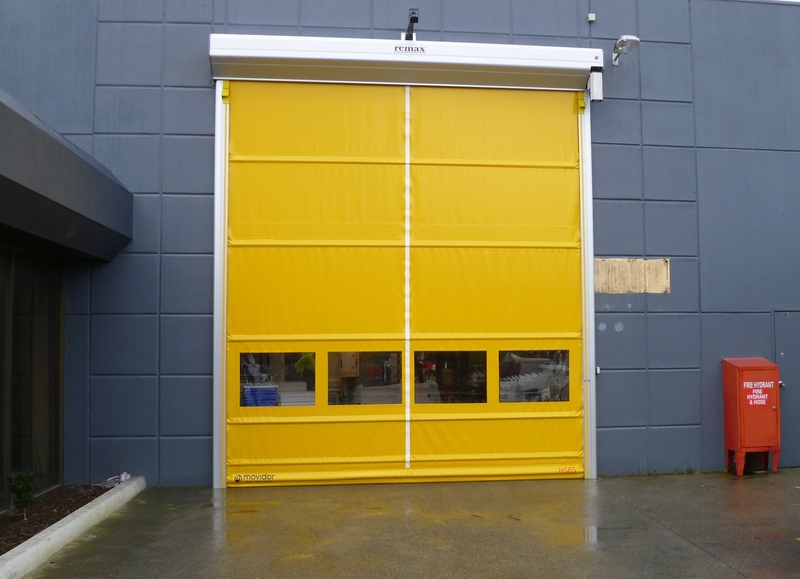 If you have a rapid roller door, informing your team about the speed at which it should be approached, how to override it in case of emergency and what its purpose in the warehouse is, will go a long way in increasing the safety of your warehouse and its operational efficiency. Cost, for many is not only the most important but also the only consideration. However, the cost of a door goes past initial installation and purchasing. You should also consider your potential cost savings through durability and quality. Most companies will charge you a hefty fee for a call-out repair job. A door that can be repaired by someone in your warehouse or even has a self-repairing function is a better investment than a door that no one can fix except the distant and expensive supplier. The major costs to consider other than the initial investment are maintenance costs, efficiency costs and safety assurance costs. Maintenance costs involve the general upkeep of the door, servicing and repair. Efficiency costs include energy loss through poor insulation, wasted energy from lifting an unnecessarily heavy door and slow closing doors creating more opportunity for an unwanted temperature fluctuation. Safety assurance costs involve the training mentioned earlier and any other associated safety procedures. By combining all these costs you can decide exactly how much the door is going to cost you, not just when you buy it but for its entire operational life. With these 5 considerations you can get a general idea of what door you need. If you are trying to decide on the specific type of door you need, our recent blog gives a comparative analysis of strip doors and roller doors. Or if you want a more in depth assessment of which door you should be buying please download our free Warehouse Door Report by clicking on the link below.